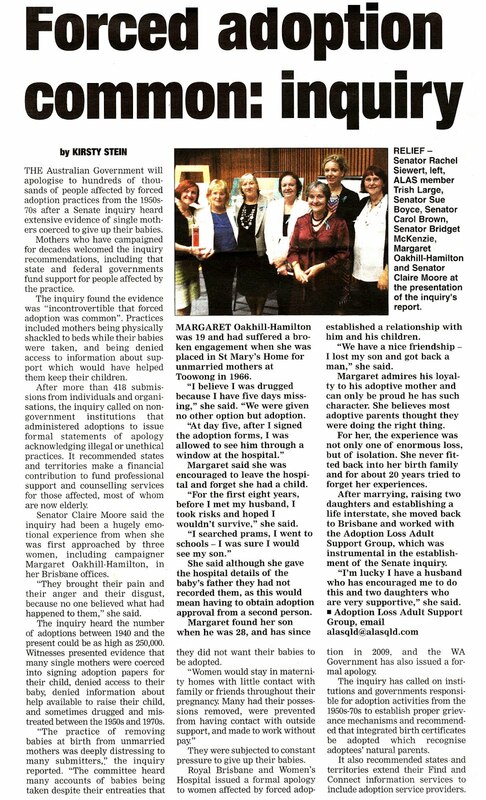 We are a group of mothers whose babies went to adoption, and adopted women. We are in different stages of reunions and some have vetos against them. ALAS was established in 1989. We meet on a monthly basis both on the Northside and Southside of Brisbane, Qld, Australia. Special Mothers Day Lunch At The Ox Margate. 12th May 2012. Join us for a special lunch for mothers and adoptees who are separated on Mothers Day. RSVP: by Thursday 10th May 2012. Contact Trish for booking; 0417 077 159. Our next meeting is on the northside. It will be at a private home. Time; 12 o'clock to 4 o'clock. Please bring a plate to share. Gold coin donation would be appreciated. Marg; 0402 336 480 for details. 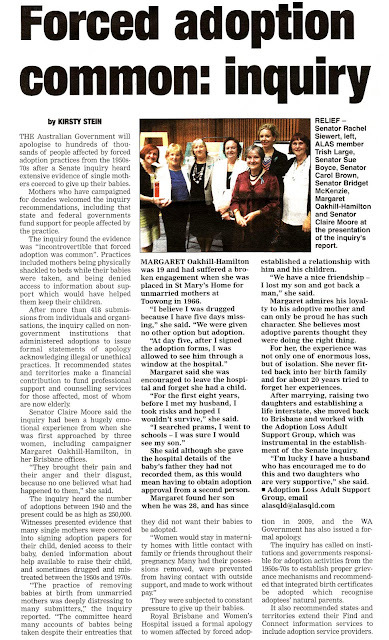 Published – Forced adoption common: inquiry. The Australian Senior Newspaper. Click the image for a larger view of this newspaper article. This can be viewed on digital paper on Seniors Newspaper online. The article appears in every states addition.